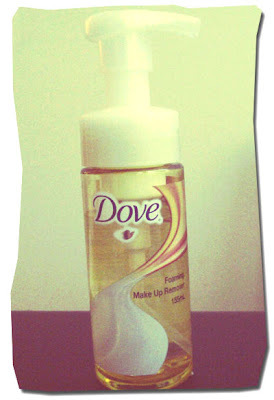 Today brings another product review - this time it's Dove's Foaming Makeup Remover. It may not show much on this blog, but I am a super skincare nut. I try everything from eye creams to microdermabrasion to serums and sleeping masks. Some of them work for me, some just sit at the bottom of my skincare drawers. Because of my insane addiction to all things skincare, it baffles me to find out that most girls out there are not using a makeup remover before using their regular cleanser. Regular cleansers are nowhere near 'powerhouse' enough to be able to remove all the pore-clogging makeup and sunscreen that we slather on before going out each day. That's where your makeup remover comes in. Dove's PR was kind enough to send me this makeup remover to trial, and I have been using it for a little over a week? I am bad with time guess-timates, so don't take my word for it. Anyway, here are my thoughts on the product! This makeup remover comes in a yellow transparent bottle, with a pump. The contents are liquid, but later into a rich foam when pumped. Conveniently enough, there is also a stopper that you can attach underneath the pump for easy travel. Dove claims that this product 'removes even the heaviest make-up including waterproof mascara, eye make-up and foundation'. I think it definitely lives up to expectations! You're meant to use 3 pumps of this, but I find 2 pumps to be more than sufficient to remove all my makeup. Also, with 3 pumps, I think I would run out of this really quickly. Whenever a makeup remover claims to be that good, I always test it against my ultimate difficult-to-remove mascara - the Majolica Majorca mascara. This makeup remover proved itself worthy - my mascara was completely removed! One thing I must warn you of with regards to this product is that it stings the hell out of my eyes. I am partial to wearing heavy eye makeup because I don't have much going on in the eyelash department, so most of this product is focused on my eyes when I am cleansing. I need it to reach my waterline, so I have to crack my eyes open just the tiniest bit. This is when it starts to sting like crazy! I recommend you only buy this product if you wear a normal amount of eye products, and if you don't put eyeliner in your waterline, or tightline your upper lashline. Otherwise, I definitely recommend you purchase a gentle eye makeup remover to use in conjunction with this product. I would definitely repurchase this! It's great for removing everyday makeup, and at such an affordable price!